The multitude of condolences and shared stories attest to the fact that Jim was not only an inspiring musician but also a man with a huge heart. Sadly, his heart has stopped beating but his music endures and the treasured memories live on in all of us. In keeping with Jim’s quiet and unassuming nature, his sendoff in December 2013 was attended only by the immediate family. Not only is Jim Hall one of the jazz world’s favorite guitarists, but he also earned critical acclaim for his skills as a composer and arranger. The first formal recognition came in 1997 when Jim won the New York Jazz Critics Circle Award for Best Jazz Composer/Arranger. His pieces for string, brass, and vocal ensembles can be heard on his “Textures” and “By Arrangement” recordings. His original composition, “Quartet Plus Four,” a piece for jazz quartet augmented by the Zapolski string quartet, was debuted in Denmark during the concert and ceremony where he was awarded the coveted Jazzpar Prize, and later released on CD. 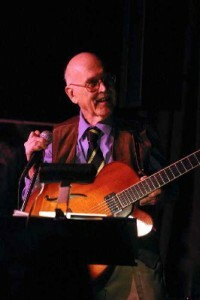 This is the official web site for jazz guitarist Jim Hall. Also visit his ArtistShare website: JimHallMusic.com.